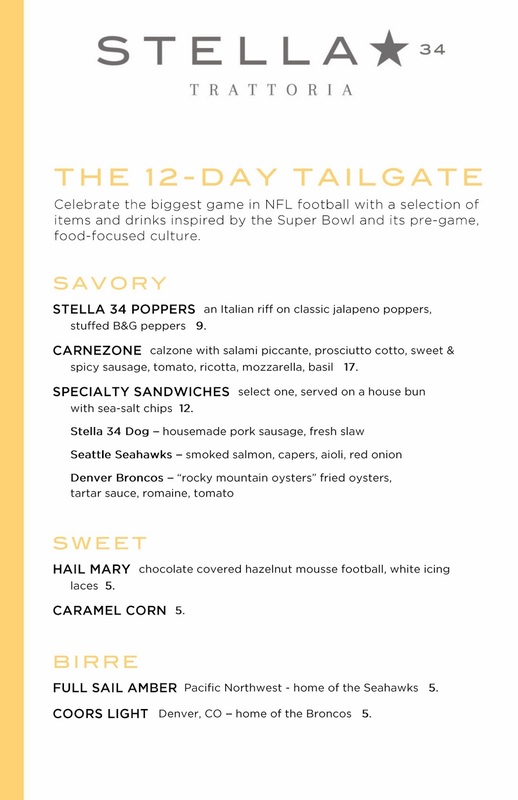 Super Bowl Boulevard is going up as we speak, but there's already a tailgate menu at Stella 34 in Macy's Herald Square. It involves caramel corn, Italian-style poppers, team-inspired sandwiches, chocolate-covered hazelnut mousse footballs with white icing laces, beer from both the team's cities, and more! Just think: starting Wednesday, January 29th at noon, you can stroll Super Bowl Boulevard, enjoy all the big game attractions, and then stop by Stella 34 inside Macy's to dine on their tailgate specialties, perfect for couples, families, and kids of all ages. How about game day itself? Make reservations at Stella 34. Not only will you have great views of Super Bowl Boulevard and the Empire State Building, but for $80 you get an impressive spread (menu below) of unlimited food and drink. 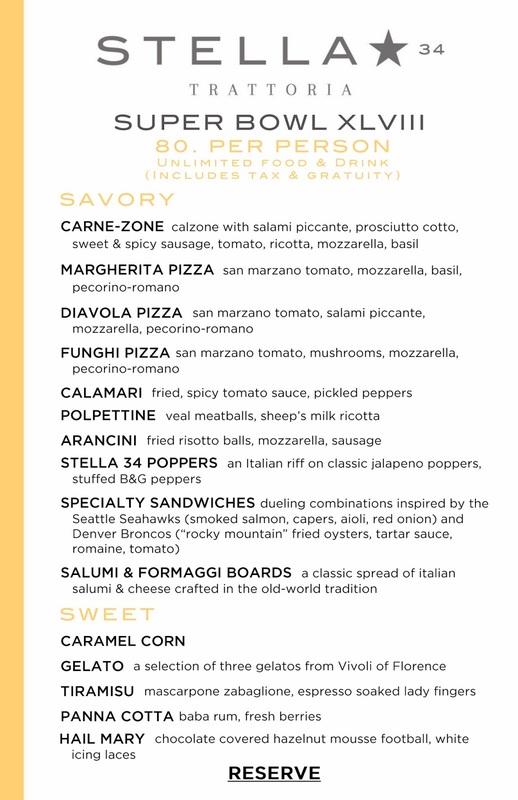 You and your friends will be chowing down on Stella's famous Arancini, fried Calamari, authentic Neapolitan pizza, classic salumi & formaggi boards, and all of the special tailgate menu additions. Stella 34’s 240-foot bar will also be offering opposing beers from Seattle and Denver and Italian wines. Stella 34 for New York City's historic Super Bowl XLVIII: the perfect mix of food, city, and Super Bowl fun!